What if I said you could eat a delicious meal while enjoying some of the best scenery Hawaii has to offer? You might wonder: Which restaurant could she POSSIBLY be talking about?! In fact, I’m not suggesting a restaurant at all. Rather, I’m talking about having a good old-fashioned picnic. Remember those?! Here in Hawaii, it’s easy to grab-n-go. But, finding the perfect picnic spot may take a bit of research. Luckily, we’ve done the research for you and have come up with our top six picnic spots in Hawaii. Read-on to find out where you can enjoy a delicious meal while also soaking-up an amazing view. 1. Lulumahu Falls on Oahu: If you like to take your meals with the soothing sounds of a waterfall in the background, you may want to consider taking the short hike to Lulumahu Falls. The Lulumahu Falls Trail is a 1.6 mile lightly trafficked out and back trail located near Honolulu, tucked away up the Pali Highway. It features a waterfall and is good for all skill levels (which means you can trek there, even holding a large picnic basket). The trail offers a number of activity options and is accessible year-round. Dogs are also able to use this trail. The waterfall is located near the Kaniakapupu Ruins, King Kamehameha III’s summer home. Keokea Beach Park on the Big Island is a great place for kids because there is a pool of water that is protected nearby. 3. Waimea Falls Park on Oahu: One of the best afternoons I’ve spent was with friends (and their children) hiking and having a picnic at Waimea Falls Park on Oahu’s North Shore. Sure, it takes about 45 minutes to get there if you’re staying in Waikiki, but this lush botanical park is worth the drive. Not only can you have your picnic at one of the many open spaces on the park’s grounds, but you may even get a visit from a peacock while you’re eating. Or, save your picnic lunch for Waimea Falls at the end of the paved trail. Great for kids, especially. 4. Iao Valley State Park on Maui: A paved 0.6 mile walk provides a scenic viewpoint of Kukaemoku (Iao Needle), an erosional feature which abruptly rises 1200 feet from the valley floor. A great place for a picnic is in Kepaniwai Park Heritage Gardens. The gardens memorialize the multicultural history of Maui, with buildings and gardens representing Hawaiian, American missionary, Chinese, Japanese, Portuguese, Korean, and Filipino cultures. The gardens were restored in 1994, and are a nice place to stroll around and relax. Note there is a $5 parking fee. 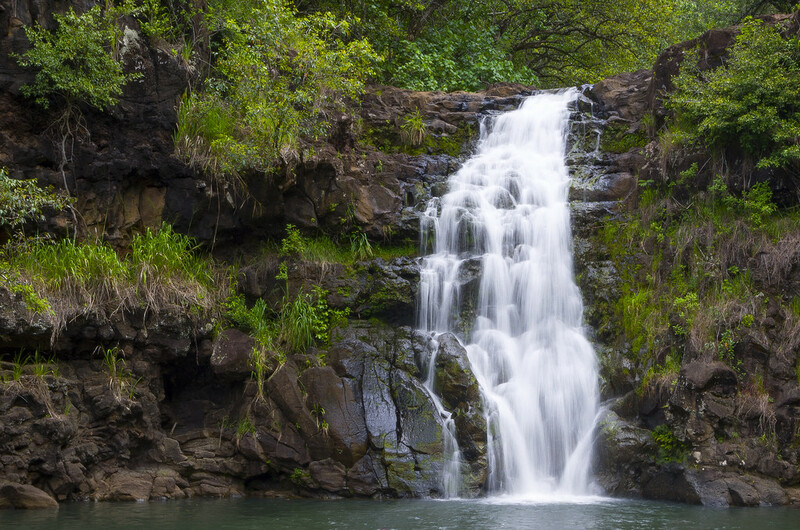 Waimea Falls State Park is best known for its water falls, a popular picnic spot for visitors. 5. Salt Pond Beach Park on Kauai: Salt Pond Beach Park is especially good for families with small children, since it has a number of protected shallow pools that offer great snorkeling for the little ones. The water is generally quite clear here and the natural fringing reefs help keep the water fairly calm. Tide pools on the East side of the beach are a great place to discover additional Hawaiian marine life. A lifeguard is posted here and you will find restrooms, showers and shade pavilions in the park. 6. Ehukai Pillboxes on Oahu: The Ehukai Pillbox trail is better known as the Sunset Pillbox Hike, because it has some beautiful views of Ehukai Beach (better known as Banzai Pipeline) and the North Shore coastline. Located behind the Sunset Elementary School, this Oahu hike will take you about 30 minutes to climb up to the top. Reward yourself with some grindz (food) and a view after the somewhat-strenuous hike. Of course, you can incorporate a picnic into many of the Hawaii activities provided through Hawaii Aloha Travel. For example, if you want to take your no-host lunch to one of the many beautiful waterfalls on the Exclusive Waterfall Jeep Tour, just talk with your guide about arrangements. Anytime is a good time for a picnic here in Hawaii, and you never have to venture far to find the perfect spot for a meal + a view. So grab your basket, some company, and some stamina — and enjoy these six picnic spots in Hawaii.